If you are looking for a planner that mirrors the integration of faith into the rest of your life, look no further than the Well Planned Prayer planner. Well Planned Prayer is a comprehensive planner designed to enrich your prayer life as you manage day-to-day living. I designed each section to aid you in keeping track of daily to-dos, scheduling activities, creating menu plans, organizing grocery shopping lists, and much, much more. If you are new to Well Planned Prayer, or if you are still trying to decide if this is the planner for you, take a look inside the 2019-2020 edition while I walk you through each section. Take a Look Inside the Well Planned Prayer Planner! As you open the first pages of Well Planned Prayer, you will find help for using the your new planner. I have included a sample weekly spread with instructions for how to use it and an article to help you develop a habit of planning. This area allows you to add memories and photos of your family for the year. Your planner will become a keepsake for years to come. This page allows you to see the full school year, see a list of major holidays, and make general notes about the upcoming year. Keep vital contact e-mails and phone numbers here. This is also the place to reference an emergency contact and favorite websites. Utilize this page to divide household chores into each day of the week. For those once- or twice-a-year projects, like cleaning out winter clothes, gutters, or the shed, chart these in the monthly spaces. These double-sided, tear-out sheets can be laminated and used year round with dry erase markers. Use them to teach children the importance of daily responsibilities and prayer. Having a plan makes it easier to keep the house clean. These pages include an article outlining the 15-minute weekly purge strategy and help for organizing common household chores. This sheet helps you schedule and maintain a balance in commitments and responsibilities. Begin by adding the time needed to feed the family, then add school and work schedule, household chores, and extracurricular activities. With a bird’s eye view of what your week looks like, you can adjust if you are over-committed or have time to do more! Copy and use this form as often as you like. Here you can detail your daily schedule with all your personal tasks and goals. This section includes an article on how Jesus taught us to pray. To aid you in praying for yourself, I’ve included a quick reference section with prayer themes pulled from Psalm 27. These pages incorporate a fantastic article on the ins and outs of journaling in your quiet time. From the benefits of journaling and detailed instructions on a variety of methods to the monthly journaling pages, my hope is that this year you will experience the joys of journaling. In order to care for others, you must first make sure you are cared for. In this area, I have included a self- care assessment, an article on how prayer and good reading aid in self care, and a full page of self care ideas. Also included is a reading goal sheet with a list of recommended reading for the year. This year I’ve made sure to include a couple of general note pages. You’ll find them right before the July section. Each month, there is a large, two-page calendar with space to note appointments and events. This section also includes encouraging articles and a thematic plan to read through the Bible in a year. Included each month are uniquely designed tear-out shopping lists to accompany the dinner menu planning area on the weekly layout. 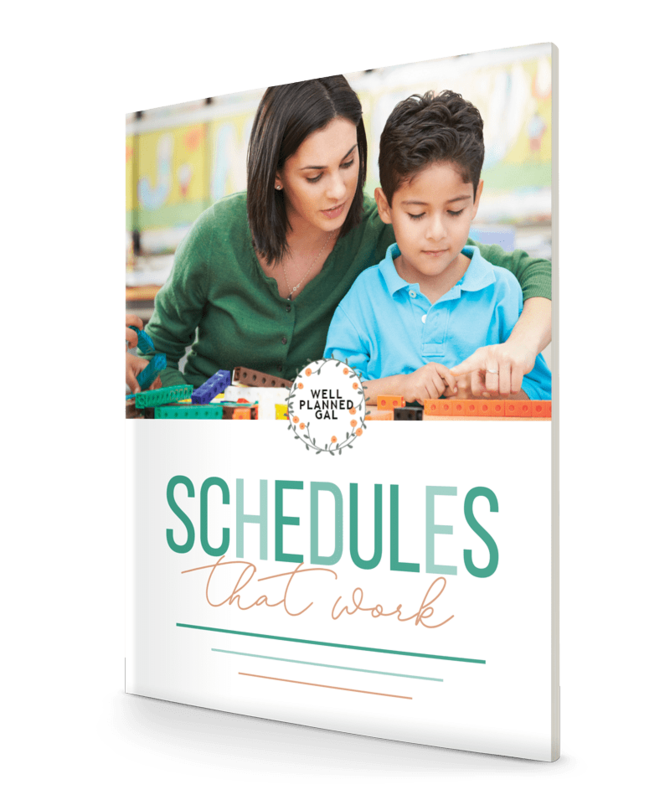 Each month, rotate and assign chores to children, set goals for projects around the house, and budget household purchases. Each month, I’ve included Scripture of the Day and Going Deeper pages for more in-depth study of the Bible. These are great logs that allow you to look back and reflect on what the Lord is doing in your life. The weekly layout is the core of your new planner. There are full columns for all seven days of the week. The first set of lines are for planning your to-do lists or jotting down ideas each day. Use the small colored boxes to mark your to-dos complete. Next, there is a section to plan for self-care. Below this, you’ll find an appointment area containing morning, afternoon, and evening spaces. Finally, each day has a meal section with breakfast, lunch, and a large area to plan for dinners. The final column contains an area to journal your prayer requests for the week, helping you to stay focused. Below your prayer list are two large areas to record answered prayer and your weekly praise. Nestled between the months of November and December, I have included a holiday organization section. Use this area to plan Christmas cards; keep up with Thanksgiving, Christmas, and New Year’s events; and track gift giving and shopping in stores and online – continuing to keep everything in one place and easy to organize. This year, I’ve included a 2019-2020 Year at a Glance page along with July, August, September, and October months to schedule events beyond the school year. These can easily be transferred to your new Well Planned Prayer next year. Throughout the year, utilize these pages to record summer bucket-list items and plan for a family vacation. From packing to itinerary, this area is simple, yet comprehensive.